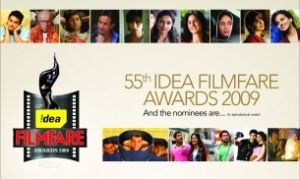 The most awaited award ceremony of Bollywood, the 55th Idea Filmfare Awards, kicked off with Karan Johar, Shah Rukh Khan and Saif Ali Khan hosting the event. The event was hosted in Yash Raj Studios, Mumbai to honour the movies released between 2009 – 2010. Bachchan’s finger salute to Filmfare – Bachchan’s boycott the award night, as they are demanding a public apology from Mumbai Mirror(partner of filmfare) for publishing false article about Aishwarya’s health. We missed Aishwarya’s performance. Amitabh Bachchan and Vidya Balan bagged the black lady for best actor and best actress category. 3 Idiots got the honour for best film and best director( Raju Hirani) award. Shashi kapoor and Khayyam received the Lifetime Achievement Award. Shashi Kapoor received the award from Shabana Azmi and Yash Chopra, and Asha Bhosle presented the award to music composer Khayyam. Asha credited Khayyam for her urdu and ghazal singing. 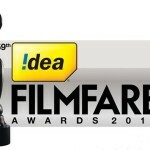 Although Kaminey received the maximum filmfare nominations, but it failed to get any award except “Best Visual Effects Award “. 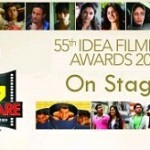 Obituaries for indian cinema greats – Filmfare also paid tribute to people who passed away last year. Bina Rai, Shakti Samanta, Feroze Khan, Prakash Mehra, Gulshan Kumar Mehta, Simple Kapadia, Joginder, Leela Naidu, Sujit Kumar, Tahir Hussain and Nirmal Pandey. 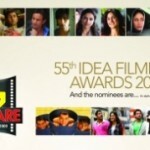 The 55th Idea Filmfare Awards will be telecast on 7th March on Sony Entertainment Television, 8:00 pm IST.